2012 Skoda Citigo Green tec review | What Car? 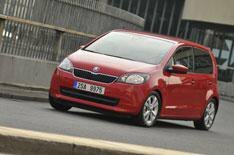 The Skoda Citigo is the companys version of our 2012 Car of the Year, the VW Up. There are two 1.0-litre petrol engines available, with either 59bhp or 74bhp. Both get a five-speed manual gearbox as standard, while Skodas ASG (auto) box is an option. Here were driving the Green tec model for the first time; it uses the 59bhp engine, but comes with an engine stop-start system and low-rolling resistance tyres that improve fuel economy from 62.8mpg to 68.9 and cuts CO2 from 105g/km to just 96g/km. Whats the Skoda Citigo Green tec like to drive? The 59bhp engine performs very well in town, whether youre asking for a sudden burst of pace, or simply trying to keep up with traffic. Once on the motorway, however, it starts to struggle. It needs to be thrashed to get up to speed and struggles to maintain momentum when going up hills. Some road noise annoys on faster roads, too, but there isn't much wind noise. Despite its tiny size, the Citigo rides bumps and potholes well. Whats more, it feels composed in bends and the weighting of the steering is nigh-on perfect at all speeds. Whats the Skoda Citigo Green tec like inside? Skoda has managed to make the cabin functional without leaving it feeling cheap. Everything on the dash is logically positioned and clearly labelled. Whats more, all-round visibility is excellent, which helps when youre trying to squeeze into tight parking spaces. Impressively, theres enough headroom in the back for six-footers to sit in relative comfort, but rear legroom will become an issue if the two up front are tall as well. The boot is big for the class at 251 litres more than enough for food shopping. Its larger than the rival Kia Picantos by around 50 litres. Should I buy a Skoda Citigo Green tec? That depends. This Green tec version of the Citigo will cost around 350 more than a regular 59bhp Citigo, and itll take you more than 10 years to make that back in road tax savings alone. However, if you regularly venture into Londons Congestion Charge then its a no-brainer; youll save a tenner a day in charges by choosing the Green tec.